The Islamorada Fishing Club would like to offer you the opportunity to be a part of our Captain’s Cup Dolphin Tournament. The tournament will take place June 26 and 27, 2019. The tournament has a rich history with up to $25,000.00 in prize money awarded to the winning team. The fishing club offers our anglers and exceptional fishing experience from kickoff to the awards dinner. You can be a part of the experience. We hope you will join us in making the Islamorada Fishing Club’s tournament the best tournament in the Florida Keys! 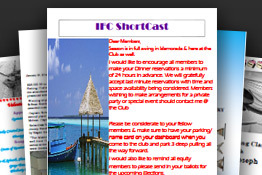 Check out the latest news for the Islamorada Fishing Club with our most recent IFC Shortcast!